What Does Code P2000 Mean? The P2000 code usually indicates that the powertrain control module (PCM) has detected a level of nitric oxide (referred to here as NOx), as reported by the post-catalyst NOx sensor, that is higher than desired. Bank 1 refers to the side of the engine containing the number one cylinder. NOx is emitted as an operational consequence of the lean burning internal combustion engine. The typical three-way catalytic converter systems that are used in gasoline burning engines are less than efficient in diesel engines, because of the higher oxygen content of the spent exhaust gases. For this reason, a secondary method of NOx reduction must be used in diesel engines. This system is commonly referred to as a NOx trap or NOx adsorption system. Only vehicles that are equipped with diesel engines use selective catalytic reduction (SCR) systems, of which the NOx trap is a component. The typical NOx adsorption system utilizes materials such as zeolite to trap the NOx molecules to prevent them from being released into the atmosphere. The structure of zeolite compounds is affixed inside of a housing that resembles a conventional (three-way) catalytic converter. Engine exhaust passes through the housing and NOx particles are trapped inside. In order for the zeolite structure to be rejuvenated or refreshed, combustible or flammable chemicals are often introduced through an electronically controlled injection system. Various chemicals have been used successfully for this purpose but diesel fuel seems to be the most practical of the lot. The rich condition created by the introduction of diesel fuel (or other reductant compounds), combined with the extreme temperature of the adsorbent element, causes the zeolite element to release trapped NOx particles as water, nitrogen, and trace amounts of carbon dioxide. If the NOx trap fails to be refreshed adequately, a code P2000 will be stored and a service engine soon lamp may be illuminated. One or multiple NOx sensors are used in a similar fashion to the way that oxygen sensors are used for gasoline engines, except that they have little to do with fuel delivery adaptation strategy and they monitor NOx particles as opposed to oxygen levels. 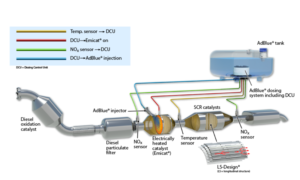 Pre catalyst and post catalyst NOx sensor data is monitored and compared by the PCM to determine whether the NOx trap is operating efficiently, or not. This data is also used in the strategy for NOx reductant fluid delivery. The PCM is usually responsible for reductant injection but there are applications that utilize a separate SCR controller to deliver diesel fuel, diesel exhaust fluid, or some other type of reductant to the NOx trap. This is accomplished with an injector that is electronically controlled by either the PCM or the SCR module. Some systems use a remote reservoir that contains NOx reductant fluid. The reservoir resembles a small fuel tank and the entire system remains pressurized with the engine at or above normal operating temperature. This is accomplished with an electronically controlled fuel pump. The NOx reductant fluid is injected into the NOx trap as commanded by the control module. 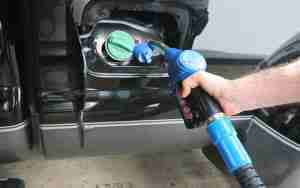 Other systems utilize stored diesel fuel, injected in a similar manner. If the PCM detects a failure of the NOx trap to sufficiently reduce the level of NOx that is being emitted by the exhaust, a P2000 code will be stored and a service engine soon lamp may be illuminated. What are the common causes of code P2000? What are the symptoms of code P2000? How do you troubleshoot code P2000? An advanced scanner, a digital volt/ohmmeter (DVOM), and a manufacturer’s service manual will be required to correctly diagnose the code P2000. Begin with a visual inspection of all system wiring and connectors. Don’t forget to check the battery terminals and cables, as well as the battery itself and check alternator output. Inspect the SCR and the exhaust system for obvious defects and make repairs as needed. If applicable, ensure that there is adequate reductant in the diesel exhaust fluid reservoir and that it is of a suitable quality. Follow manufacturer’s recommendations carefully when adding replacement diesel exhaust fluid. Test exhaust gas recirculation (EGR) operation using the scanner. If EGR codes are present, repair them before attempting to diagnose this code. Connect the scanner to the vehicle and retrieve all stored trouble codes and freeze frame data. This information may be helpful in diagnosing a P2000 code. Clear the codes from the system and start the engine. I would test drive the vehicle, after allowing the engine to reach normal operating temperature, to see if the code returns. If it fails to reset, this code may be intermittent and much more difficult to diagnose (if not impossible without allowing the condition to worsen). If the code immediately resets, connect the scanner and observe the NOx sensors in the data stream display. Narrowing the data stream to include only pertinent data will provide you with much more accurate information. The upstream (pre NOx trap) NOx sensor should fluctuate between approximately .1 volts (100-mv.) and 1-volt (1000-mv. ), when the engine is at idle. The downstream (post NOx trap) NOx sensor output voltage should remain much more stable than that of the upstream sensor. If this is not the case, suspect a defective NOx trap element or diesel exhaust fluid injection system malfunction. If either of the NOx sensors are inactive, check for a blown fuse in the engine bay or under the dash. Most NOx sensors are of a 4-wire design with a power wire, ground wire, and 2-signal wires. Use the DVOM and the service manual (or All Data) to test for battery voltage and ground signals. Test sensor output with the engine at normal operating temperature and the engine idling. Bogus codes from weak battery?? As stated in the article, I would check my diesel exhaust fluid (DEF) and DEF injection system to see if it is functioning properly. If there are DEF codes present; fix those first. I see that you have exhaust codes pertaining to both banks of the engine. I would check EGR operation. Make sure that the EGR valve is opening when commanded and that it has not been deleted or replaced with an aftermarket part. If the EGR system is functioning as designed, use the scanner to observe NOx sensor data with the engine at normal operating temperature and running. Compare the signal of the upstream and downstream sensors to determine whether the NOx trap/particulate filter is operating efficiently. More than likely, you have an EGR problem, an off-road diesel fuel situation, or a DEF problem.